What is the mystery of the M67? Quite simply - where was it supposed to go? As pointed out on the main page, both ends of the M67 are unfinished, showing that is was supposed to go somewhere. Unfortunately, very few people knew where. This is a mixture of facts and educated guesses, and attempts to show what might have been. If anyone has any more information, please contact me! Are you going to take me through it? Yes, of course! All junctions shown on the maps are "best guesses". It's not a big secret that the M67 was supposed to go towards Manchester City Centre. Its route somewhere along the A57 corridor is also hardly a secret. For many years, well into the 1990s, much of the area around the A57, especially between the A57/A6 junction and Gorton, was a derelict wasteland. Some 1990s infill has taken place, especially in the Belle Vue area. But why was it this way? The M67, of course. The suburbs of Ardwick, Gorton and Debdale along Hyde Road used to be thriving residential communities with villa housing, complemented by shops along the main road. What would now be called a “theme” park existed at Belle Vue, with a Zoo. All this housing, shops, recreational facilities, etc., was demolished to make way for the scheme, hence the large scale depopulation of Manchester as a whole. The demolished areas were left largely derelict (bar Fort Ardwick, similar to the Hulme Crescents but built in concrete/brick), set back from the line of the proposed motorway. When the M67 urban section was dropped, the monolith (Fort Ardwick) was demolished in the late 80’s and then replaced by low-rise social housing in the early 90’s (the site that faces Hyde Road bus depot). A bit of further “tidying up” was done with the construction of Showcase Cinemas, and British Car Auctions, on the former Belle Vue complex, just leaving the dog racing and speedway tracks left over from the original. What isn't well known, or obvious today, is that there was a plan at the time of the M67 construction, for a new Ring Road. This is not the same scheme as the A6010 Intermediate Ring Road scheme of the 1990s, but was a "grade separated" (have flyovers or underpasses) route south of the A57(M) Mancunian Way, running from Great Ancoats Street in the east, from there to near the Apollo Theatre, at the A6/A57 junction, round to a junction with the A5103 Princess Street north of Moss Lane East, and from there round to the city boundary on the A56 Chester Road. We know that the M67 was supposed to start on a Ring Road, and we have guessed that this is the one. It has been marked as a motorway, as the majority of "grade-separated" roads of the time were designated as such. This may, of course, not be the case here. It's fairly obvious that the motorway was to head in the general direction of Sheffield. 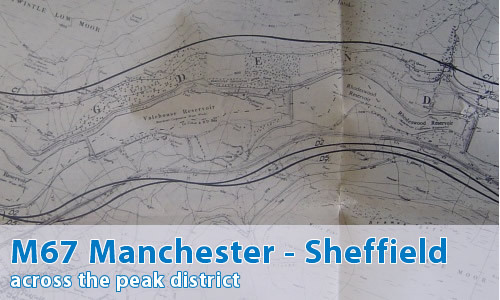 Signposting in the Manchester area all suggests "Sheffield (M67)", so that's no great secret. As the photographs show, the motorway was to pass north of the current junction 3 roundabout. The motorway was then to continue to the north of Mottram towards Sheffield. It would have continued in a tunnel under Roe Cross Road (which is on a slight rise), and then swing to the west of Hollingworth (across Mottram Moor – now the route of the soon to be constructed A57 Glossop Spur), where it would follow the floor of the Etherow Valley (through what is now industrial units) and Etherow Park. The Park appears to be a reclaimed brownfield site, and so would be ideal as a route. It would then have swing round south of Bottoms Reservoir (suburbs of Hadfield) to take the route of the closed Woodhead Route (the first intercity all-electric route in the UK, proposed to be developed further by Beeching, but run-down by the Government, as it proved the ideal route for the proposed motorway). It would then travel up the Longdendale Valley along the former trackbed, until reaching Woodhead itself. The trackbed had some post-war re-engineering, and with a little widening would be very suitable. From Bottoms Reservoir, the motorway would have been within the Peak District National Park. This section is the most difficult. Either the motorway could go “over the tops” (à la M62), or utilise the railway tunnel (concrete, built in 1954). It was proposed that one carriageway would go through the tunnel, with the other going “over” Woodhead on an improved alignment, which involved the construction of a large viaduct. A COBA (cost on benefit analysis) on these proposals was commissioned by the DoT back in the late 1970s/early 1980s, headed by Peter Hall. Needless to say, the COBA result came way off any reasonable amount for a road scheme. However, the railway tunnel is very narrow, and the most likely scenario is its use as a two-way single carriageway poor weather refuge. From the western Woodhead tunnel portal, the motorway has been placed to the ledge below the A616 before crossing the River Etherow to follow the contour lines on the opposite bank. There are a couple of tall viaducts before we turn north east in a deep cutting under the A616 and descend steadily. Another couple of tall viaducts as we keep to the contour line, running south of Dunford Bridge at a higher angle. From Dunford Bridge we follow another contour line which points us at Flouch Inn. We have a roundabout interchange which would cut deep into the forest (though as the forest was hacked through when they built the roundabout we'll accept this), with the motorway emerging on the north side of the A616. It runs parallel to the existing road, though uses cuttings to ease the gradient. North of Stocksbridge is the “marooned” part of the M67 (now classified as the A616 Stocksbridge Bypass), which is the last remnant of the original M67 scheme. Opened in 1989, there has been 26 deaths at the last count (IIRC), as it was built “on the cheap” in comparison to the full blown motorway originally proposed. The watered down scheme consisted of a dual carriageway with crash barrier in the middle, however, this was downgraded further into a single carriageway road full of blind crests and with no crash barriers, aided by the occasional crawler lane. Two of the four major junctions are, however, "grade separated" (have flyovers or underpasses), and so it's easy to see how this could have been originally meant as motorway. The junctions have been changed to roundabouts, as this was standard practice in the 1970s. This road also has very poor reputation for driving standards. The original M67 link off the M1 is junction 35a. The motorway was destined to continue off those slips (they were designed to be wide enough to take the M67) and on towards Manchester (as signposted off the M1). At junction 35a, there are also a pair of unused south-facing sliproads, which could be brought into use quite easily. There should be a service area site around this area, although the slip roads are too well-engineered. Unfortunately, they are also too close to the north-facing slips to be used for anything other than a roundabout, unless a strange layout would have been applied. We have also guessed that the north-facing slips would not have survived a COBA, with a dual carriageway A61 "cutting the corner" to junction 36. Have any visitors commented on this? use the original tunnels for lorries and other tall vehicles - one lane each way. put two decks in the "new" tunnel, each carrying a further two lanes of traffic. eh voila! a D3 [three lanes each way, dual carriageway] tunnel system! This proposed motorway could never be approved except in exceptional circumstances as it runs though the Peak District National Park, a protected parkland that has been there ever since 1951! This appears on the plans from Tintwistle/Hadfield through to Fullshaw/Upper Midhope. Even the M6 only touches along the border of the Lake District National Park for just under 1 mile just as it does around the Yorkshire Dales! I note a comment from a Chris Baker saying that a motorway would never be allowed in the Peak National Park. I have thought about this over the years and I believe one thing is often overlooked. The Longdendale valley is already 'industrialised'. There are five Victorian reservoirs there already, so the valley could hardly be labelled as an area of unspoilt natural beauty. The roads, the railway and it's associated stations, tunnels, yards etc are other, obvious, man-made features. In addition there is the National Grid Thorpe Marsh - Stalybridge power lines. In 1963 a public enquiry established that the proposed run of pylons from Woodhead to Dunford over the top of the hill would spoil the area. However, the valley was not afforded this level of protection and the pylons straddle the valleys east and west of the Woodhead tunnels. Finally in 1990 the Woodhead and Torside reservoirs were enlarged, again changing the character of the Longdendale. It doesn't seem as if there is too much effective objection to development in the valley. I would argue that if the Ministry in 1966 was determined to build the M67 they would have taken great comfort that only the top of the hill had been protected from the pylons. And they could have argued that there was already a road there spoiling it anyway so a couple more lanes wouldn't hurt... Whether they would have got past the anti-road lobby as it became more organised and effective is another matter. This is just my angle on it, but I'm sure you know what it's like to have an obsession about something! It is my unfortunate duty to have to point out one small inaccuracy in the comments of one of your correspondents (Alex Richardson, who writes in about the M67). Mr Richardson is no doubt correct in his belief that the prime reason why the M67 was never extended eastwards was that it would have had to have passed through the Peak District National Park, and the Park authorities and amenity groups would never have allowed this. In Hampshire, a 4-mile section of the M27 west of Southampton is within the New Forest National Park (and here the motorway was around long before the Park came into being). Nearby, a 5-mile section of the M3 east of Winchester will pass through the area of the proposed South Downs National Park, which should come into being in the next year or two after public inquiries are concluded. The boundaries of the proposed park have been extended westwards towards Winchester across the M3 to incorporate St Catherine's Hill, a prominent viewpoint and typical of the South Downs landscape. As a keen walker I've got to know Longdendale pretty well over the last few years. It would be a spectacular feat of engineering to put a motorway or at least an upgraded A628 - how about the A628(M)? - through them; this doesn't seem so infeasible when you consider the sort of motorway tunneling that goes on in, say, the Alps. However, as a dedicated fan of the Peak District I personally wouldn't like to see Longdendale (or the Don valley on the far side of the hills, at Dunford Bridge) being used as a motorway route. The existing A628 does carry a very heavy amount of traffic but it is a thrilling road to drive, through dramatic scenery all the way from Tintwistle through to the Flouch roundabout. Among railway buffs there is a persistent rumour that a "Strategic Reserve" has been kept in the form of a number of fully operational steam locomotives, ready for use in case of national emergency if/when political problems in the Middle East or elsewhere cut off the nation's supply of oil. Presumably in such an event, some of the currently-disused coalmines would also be brought back into use, to get these kettles (as we call them) moving again. Woodhead Tunnel is prime suspect for the location of the Strategic Reserve." I remember being in the boss's office in what was then the Ferranti factory in West Gorton in about 1964, and he took a phone call from the City Council to say that the motorway down the line of the A57 was to go ahead. However, there's a lot to say about the route over the moors. We ought to think again about converting the Woodhead tunnel and the railway. It was built to the Berne loading gauge, which makes it the largest tunnel in Britain except for the Channel Tunnel. It was double track, and would therefore have been about 35 feet wide at ten feet above the base, and rising to maybe 16 feet above the tracks at the centre of its arcuate shape. Motorway bridges need 16 feet clearance throughout. So the tunnel is just not big enough for a motorway, with very limited clearance even for an ordinary road. The total distance between the edges of the trackbed outside the tunnel might have been as much as 40 feet, to allow a bit of strength at the sides. On bridges it would have been a bit narrower. A three-lane dual-carriageway motorway is 36 metres wide at minimum (more than 100 feet), a two-lane one only about 95 feet. But yes, other countries, notably Italy, build motorways in tunnels like there was no tomorrow. They don't seem to have motorways in Norway, but there's a two-lane road tunnel able to take the largest lorries that's over 15 miles long. This would stretch from Tintwistle to Stocksbridge, and puts the three-mile Woodhead tunnel in some kind of perspective. I think it's quite true that Authority chickened out of putting a motorway across the national park, and that's why the M62 was built. The traffic stays on the Woodhead route, however, because Manchester to Sheffield that way is about 40 miles, and via the M62 it's exactly twice that. In response to Paul Townsend suggesting there may be a strategic reserve of steam locomotives in the Woodhead Tunnels I see a major problem with this theory, the inaccessibility of the site itself. There is no current track either side of the tunnels for a long distance (Glossop on the Manchester side and a brief section of the Barnsley Branch at Penistone on the Sheffield end). The tunnel openings themselves are difficult to access by road. The old Woodhead station although literally underneath the current A628 is accessible only by a narrow steep gradient track. Dunford Bridge is more accessible, but is still located on a twisty narrow B-road. What I am trying to say is in the event of a fuel emergency short of laying at least 5 miles of track quickly, an armada of steam trains under Woodhead would be inaccessible and useless. If a situation such as this occurred I'd believe the government would commandeer the engines in use on Britain's pleasure railways. As it stands I believe that at least one tunnel contains a gas pipeline. But local stories persist regarding rebuilding the railway line, possibly as a roll-on roll-off lorry transporter, similar to the channel tunnel between Stocksbridge and Glossop. The A628 is currently desperate for expansion, particularly near to the M67. Attempts are underway to build a bypass of Mottram and Tintwistle to ease the pressure on these villages which have daily queues featuring large numbers of HGVs. However for various reasons as yet the bypass looks as distant as a complete M67. The "new" (1950s) Woodhead tunnel has a cement lining and could only be used by electric trains, the exhausts from steam and diesel trains would have damaged it. That could prevent it ever being converted for road vehicle usage without reconstruction. The two original single bore tunnels are in a very poor state of repair, one reason why a new tunnel was built for the Manchester-Sheffield-Wath railway electrication project. One bore carries the high voltage trans-Pennine power cables, which will shortly need to be renewed. The power company wants to run the replacement cables through the "new" tunnel, which still carried a operational railway when the original trans-Pennine grid line was constructed. That would prevent the "new" tunnel being reopened as any form of transport link, road or rail. Not wishing to argue, but David Unwin is I think mistaken about the new Woodhead Tunnel. Diesels were permitted through it. I have been through it four times on scheduled passenger services, behind two class 76 electrics and a class 37 diesel, and on a class 101 diesel unit. Thanks to Charles Ashbury for much of the information, and to Ian Bailey for his work creating the route maps.